Approaching Swartz Bay Dock taken from BC Ferries boat. 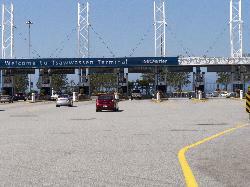 Photo of the Swartz Bay Terminal on Vancouver Island. Taken from BC Ferries boat, as it is approaching the dock. The boat Lift at Big Chute, in Ontario Canada. Along the Trent-Severn Waterway. Sign showing how the Big Chute Marine Railway operated. Close-up view of the sign at Big Chute Marine Railway. Click on image for a larger version. Drive up to BC Ferries Tsawwassen Terminal near Vancouver British Columbia. A photo of a memorial plaque erected along the shores Lake Simcoe at Kempenfelt Bay in Barrie. Honour Joseph C. Morrison, who was president of the Ontario, Simcoe and Huron Railroad Union Company. Depicts an illustration of a sidewheel paddle vessel build in 1854. In 1857 the steamboat took fire and sank. A photo of a memorial plaque erected along the shores Lake Simcoe at Kempenfelt Bay in Barrie. Describe how the 'Sir John Colborne' steamboat Launched in 1832 as one of the first of many steamboats on Lake Simcoe. Installed by the Ontario Heritage Foundation. This photo show two plaques erected along Kempenfelt Bay. These plaques are dedicated to Steamboat J.C. Morrison and the 'Sir John Colborne'. Swartz Bay Dock taken from BC Ferries boat. This is the boat lift on the Big Chute Marine Railway. 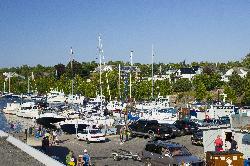 Photo of marina in Tobermory Ontario. Taken from the balcony of restaurant. Sunset photo in Toberory about the Sunset Cruise. 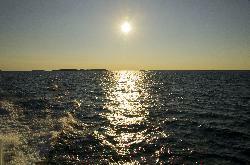 Flowerpot Island can be seen in the background. View into lock 45 on the Trent Severn Waterway. Here, the water is at its lowest point.